My memories of grocery shopping as a kid take place in the seat of the cart at Wegmans in Syracuse, staring in wonder at the roller rack where they put your groceries in after you pay and it goes out through the rubber flapper door and around to the outside of the store where you drive to pick them up. Grocery shopping is a chore. One goes to the store to get in, get done and get out as quickly as possible. Except cue zipping audio sound – why are people still so damn excited to go to Wegmans? After all these years? I’ve been out west for over 20 years now and many of my friends have moved all over the country. We all still get excited when we get to go to Wegmans. We have to check in and tell the world we’re here. It’s a grocery store, for crying out loud. I asked my friends what they love about it and I received a LOT of responses. It’s stories like those above; like mine, growing up in the seat in the cart waiting for my mom to finish her conversation while watching the cool roller thingee with baskets of groceries whizzing by. Maybe it’s stories like this one: Chris Tuttle has Aspergers Syndrome and works at Wegmans in a variety of capacities. The other day, he was yelled at by a customer for being too slow. He then became so flustered he dropped her candle she had just purchased. The manager on duty took him off the register so he could calm down and handled the irate customer. Tuttle is supported and encouraged in his job, and he loves it. Customers shop, see their neighbors and friends in the organic coffee aisle, and say hi to Chris with Asperger’s all while smiling because a guy was given a chance to do what he loves. We want them to say Yippee when going grocery shopping. We want them to yearn to be in the photo they see. We want them to feel like they can’t perform their jobs without this. We want them to feel like they have to have it. Creating that story that starts with the outcome desired and communicating it clearly to employees. customers, investors, and prospects. It drives the rest of the decisions of your business. ; hiring practices, access and distribution, and overall customer experience. 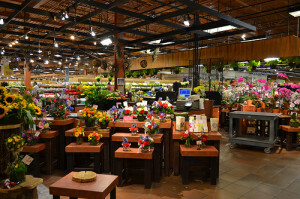 It keeps businesses whole even when they grow big, like Wegmans., allowing you to weather a variety of storms, with compass held firm in hand. Small House Winery launched their first release to a small email list over the weekend. A PDF order form was included and buyers filled it out and returned it, to get an invoice with a link to pay. This isn’t convenient and it’s not fast. From the buyer’s perspective, it takes effort. They have to want the wine. And the winery might lose buyers because the general expectation is to be able to easily and safely purchase products online in one step. This is my husband’s winery and as its marketing person, I was freaked out about the hoops we are making people jump through. Patrick said, “It’s not who we are. We are a small, handcraft winery selling $30-$40 wines for $20. (Our mission is to put better wines on the weekday dinner table.) If we invested in an ecommerce and automated shipping solution, we wouldn’t be able to fulfill that mission. Some day we will. And he’s right. Orders have been coming in from the email list alone. People don’t mind jumping through hoops to be involved in a greater story. The human brain is wired to seek survival, and happiness. It is our jobs as marketers to make that connection. Make their lives better and happier. Guess what? I’m going back east next week and I get to go to Wegmans. I love the fact that Wegmans keeps Tuttle on board. This is a smart, human e company with compassion.